Austria's Far-Right Presidential Candidate Norbert Hofer Loses In An Election Do-Over : The Two-Way Alexander Van der Bellen defeated Norbert Hofer of the conservative Freedom Party. Had Hofer won he would have become the first far-right president in Western Europe since World War II. Austrian far-right candidate Norbert Hofer (L) and his rival Alexander Van der Bellen attend a post-selection TV talk with in Vienna on Dec. 4, 2016. Austrian far-right candidate Norbert Hofer on Sunday congratulated his opponent in presidential elections after projections indicated that he had lost. 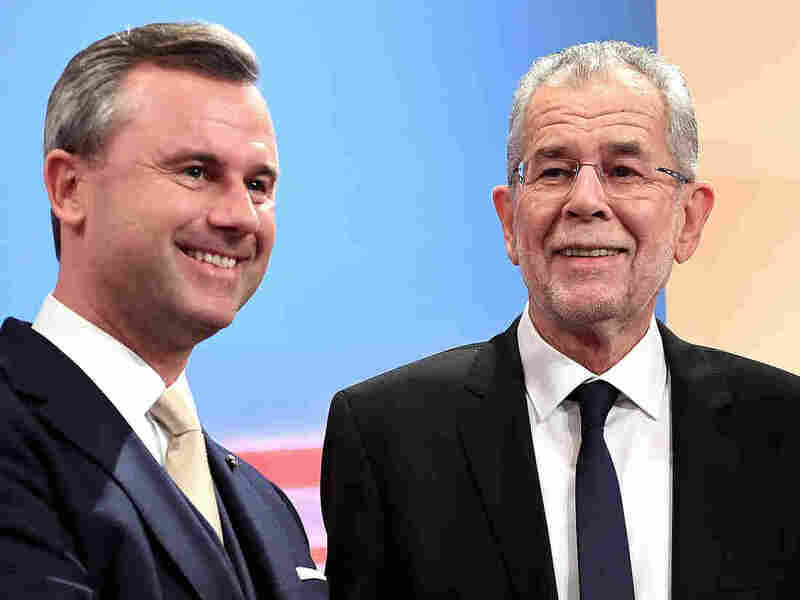 Austria's far-right presidential candidate conceded defeat Sunday shortly after polls closed and preliminary results from the election showed Alexander Van der Bellen to win 53.6 percent of the vote. Van der Bellen's opponent, Norbert Hofer of the conservative Freedom Party brought in just over 46 percent of the vote. Final results will not be certified until absentee votes are counted on Monday, according to the Associated Press. The AP also reports that election officials said the remaining ballots will not alter the outcome, but the percentages each of the candidates received may vary. Polls going into the vote indicated the outcome would be tighter than what appears to have taken place. Hofer campaigned on an anti-immigrant platform that cast a spotlight on Austria's inflow of refugees, while the former leader of the Green Party and now President-elect Van der Bellen stumped on a message of tolerance and inclusion. As the BBC reports, political watchers took a keen interest in this campaign and were using it as a litmus test of how other populist candidates may fare in upcoming elections across Europe. "The result is sure to be welcomed by establishment parties and officials in the EU. "France, the Netherlands and Germany all face elections next year in which anti-mainstream and anti-immigration parties are gaining ground. "A referendum underway in Italy is being closely followed for further signs of anti-establishment populism, with polls suggesting a setback for centre-left Prime Minister Matteo Renzi." Austria's president is a largely ceremonial role. Sunday's election was a do-over from May when Van der Bellen won by less than 1 percent of the vote. "Hofer had been poised to become the first far-right president in Western Europe since World War II and says he will run again in six years."